✓ 35 BLADES 2-IN-1 DUAL SIDED DESIGN: Start with 12 teeth side for stubborn mats and tangles and finish with 23 teeth side for thinning and deshedding. Achieve faster and more professional dematting and grooming results! ✓ 100% SAFE FOR YOUR FURRY FRIEND: The dog grooming scissor feature rounded tips that are safe for use on any area of your pet without the fair of injuring them with the tips. And The sharp steel blades of these dog hair scissors ensure a clean cut for a quicker grooming session, no matter how tangled the fur is. 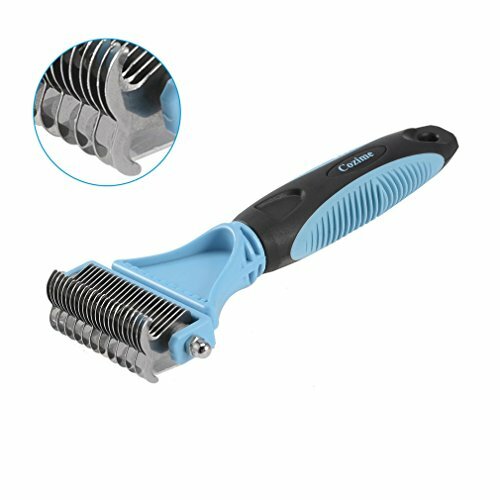 ✓ STOP PULLING THE HAIR OUT AND REDUCE SHEDDING: Slightly sharpened blades smoothly cut through the toughest mats. And regular brushing removes excess dead hair from your pet\'s undercoat. ✓ ERGONOMICAL DESIGNED HANDLES: Non-slip rubber handles that are ergonomically designed for a comfortable grip and ensuring a safe dematting and grooming experience for you and your dog. ☎ WHAT YOU GET: Dual-sided pet dematting grooming stainless steel comb, recommended by professional groomers for faster and more impressive grooming results. Perfectly suits for dogs, cats, rabbits, horses and most hairy pets. Even every purchase product includes 12-Month Warranty & Friendly Customer Service, welcome to Magicpeony famliy.